Warm, wet weather always encourages the activity of several moisture-loving animals, including millipedes, or "thousand- legged worms," and their near relatives, the centipedes. At times millipedes become so abundant, that they may constitute a "millipede invasion" entering homes and other buildings. 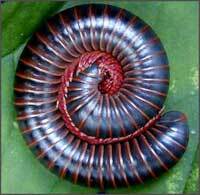 Millipedes are cylindrical, segmented, worm-like creatures, with two pairs of legs on each body segment, except for the last three, which have one pair. Over 1000 species occur in the United States. They are encouraged by wet conditions and the overuse of mulches in flower and vegetable gardens. Centipedes are related to millipedes and are also worm-like in form, but they differ in having flattened bodies and only one pair of legs on each body segment. They also possess a pair of poison claws or legs just behind the head which are used to paralyze their prey - usually insects or other small animals. 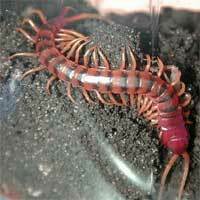 Most centipedes are beneficial, but the large species found in the tropics, which may reach a length of up to 18 inches, can inflict painful bites.